September 27, 2018, 1:00 & 8:00 p.m.
Co-created by Dong Mei (Dong Mei Dance) and Sammy Chien (Chimerik似不像), Flow(er) 蓅 is a contemporary new media dance performance that deals with themes of migration, modernization, ethnic heritage and decolonization. The work seeks to bridge the gap that exists between traditional and contemporary forms of art making by integrating digital technologies and street dance with Chinese traditional folk dance from the disappearing tribe Uyghur in the Xinjiang province of China and Qi Gong; a traditional Taoist practice connecting with the energy of our body to shift its movement and flow. 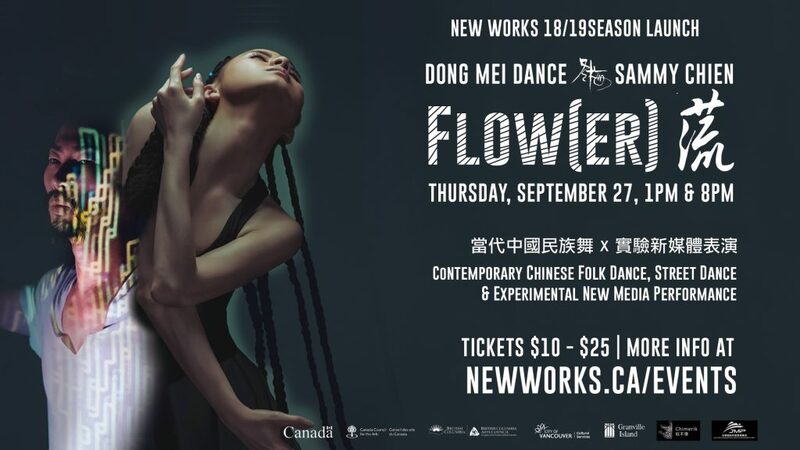 Special thanks: Machinenoisy Dance Society/Left of Main, The Dance Centre, Dance In Vancouver, Wen Wei Dance, Co. Erasga. “蓅” 是來自冬梅 (Dong Mei Dance) 和Sammy Chien (Chimerik似不像) 的共同創作, 以當代中國舞與新媒體藝術的表演形式, 涉及移民, 社會化, 民族文化遺產和後殖民主義的關係. 這次作品通過科技, 街舞, 氣功,中國漢族舞和新疆維吾爾族舞蹈的結合, 建立傳統與當代形式之間的橋樑, 開啟另一個對靈魂訴說的窗口.